Wilfrid Laurier University Assistant Professor Bree Akesson is bringing Afghan faculty from two universities together with members of leading international teaching and learning centres. Together, they will develop critical mental health curriculum support and policy framework in counseling psychology departments. "This program aims to strengthen the mental health system in Afghanistan by supporting faculty members in counselling psychology departments at Herat University and Kabul University," says Akesson, assistant professor in the Faculty of Social Work and the Social Justice and Community Engagement master's program. Recent developments in Afghanistan's national mental health strategy focus on providing greater supports for citizens with mental health challenges resulting from 40 years of armed conflict in the country. As reported by the World Health Organization, over three-quarters of the Afghan population experiences related mental health issues. For the next important task, according to Akesson, there is a dire need to prepare professional counselling psychologists to care for the growing needs of these individuals. 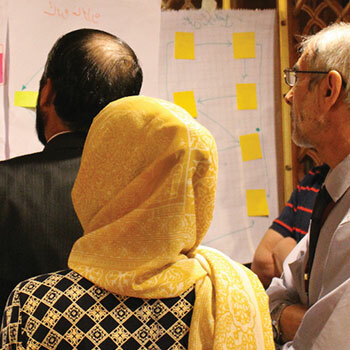 During three study tours, Afghan faculty members engage with major university centres to learn best practices in teaching and delivering counselling psychology. In January, members of Laurier's Teaching and Learning development team, including Joseph Beer, Shirley Hall and Nadine LeGros, joined Laurier research associate Carrie Wright, Akesson, and partners from other Canadian universities in India for the second tour. Laurier-led sessions focused on curriculum mapping, preparing faculty to work with students who have learning disabilities, and training around developing academic policy documents for university administrators. Indigenous approaches to teaching and healing were covered in sessions led by Elizabeth Fast and Vicky Boldo from Concordia University. "Despite our different cultural backgrounds, we found common ground almost immediately," says LeGros, a Laurier educational developer specializing in intercultural communication. "Teaching philosophies may vary among educators, but we quickly discovered that, regardless of culture, some of the main challenges we face in the classroom are common." Participants from Herat University and Kabul University cited curriculum design activities, information on aligning classroom activities with learning outcomes and assessments, and sessions focusing on the benefits of active learning as highlights of the study tour. Participants left the tour with a framework for program- and course-level learning outcomes, as well as concrete ways to weave intercultural content and competencies into their practice. "Even for topics that they may have been sceptical about, the Afghan faculty members maintained open minds and hearts to consider alternative ways of doing things," says Akesson. "They embraced new ways of looking at familiar challenges in the classroom and in counselling." While the people of Afghanistan continue to face many serious challenges, the dedication of these faculty members provides momentum towards creating an effective metal health system to address the psychosocial needs of the population. "I am inspired by perseverance of the Afghan faculty members to go to work every day and try to improve their country in the face of such hardship," says Akesson. For this project, Akesson works closely with Martha Bragin, associate professor of Social Work at Hunter College at the City University of New York. The project is funded by United States Agency for International Development (USAID) and administered by FHI-360's University Support Workforce Development Program (USWDP). This program is guided by national research on how counselling psychology is understood and delivered in the Afghan context. In addition to the study tours, Akesson and her team are providing onsite support to develop training materials, curriculum assessment tools, and further faculty development activities. The program also supports the development of a model counseling centre at each of the two participating universities. The project concludes in October 2018.